Highpoint Center for Printmaking is thrilled to announce its upcoming exhibition of prints from David Krut Projects. From March 26 through April 24, 2010, visitors to the galleries will have the opportunity to view prints from eleven South African artists. David Krut established his print workshop in 2002 as a professional facility for collaborations between South African artists and local and international printmakers. Krut invites emerging and established artists to his Johannesburg studio to create limited edition intaglio prints and monotypes. Highpoint is honored to host this outstanding group show, which builds on HP’s history of exhibiting contemporary prints from around the world. As one might expect, several of Krut’s artists use their work to explore South Africa’s fraught social history. Paul Stopforth, for example, was one of the country’s first visual artists to challenge apartheid through his work; government officials withdrew his art from the 1981 Valparaiso Biennial International Exhibition because of its controversial content. Diane Victor also condemns apartheid through her work; her prints juxtapose biting social satire with delicate mark-making. Other participants concentrate on more personal matters. Deborah Bell, for instance, works through spiritual questions with her artistic practice; she draws on imagery from both classical and African mythology. Colbert Mashile, who is of Sotho ancestry, offers viewers a stylized, surreal vision of life and customs in rural South Africa. In contrast, Maja Maljevic is inspired by modern rock music, which infuses her prints with bright colors, bold strokes and abstract forms. For many viewers, William Kentridge will be the most familiar artist in this exhibit. 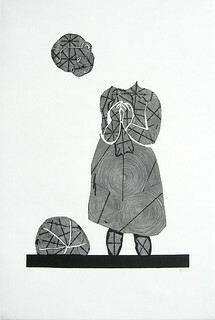 Well-known for his work in film and theater, he is also a prolific printmaker. He has studied printmaking since adolescence and has also taught printmaking. The show at HP will also feature thirty intaglio prints from Kentridge’s upcoming exhibition at the Museum of Modern Art in New York. The MOMA show surveys nearly three decades of work by Kentridge, a remarkably versatile artist whose work charts a poetic course through colonialism, totalitarianism and apartheid. Included are works related to the artist’s staging and design of Dmitri Shostakovich’s The Nose, which premieres at New York’s Metropolitan Opera in March 2010. More information on David Krut Projects is available at www.davidkrut.com.